Redesigned and reimagined from the outside in, the Audi Q5 exudes style and refinement everywhere you look. From a distinctive Singleframe grille and available full LED headlights to its prominent shoulder line and power tailgate. 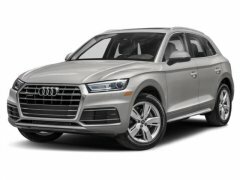 The distinguished Audi Q5 design aesthetic continues throughout the cabin of the vehicle with features like three-zone automatic climate control and an expansive wraparound dash with large infotainment display. The Q5 also has versatile cargo space with a generous 60.4 cu ft capacity with the 40/20/40 rear seatback folded down. The available Audi virtual cockpit is a fully digital 12.3-inch instrument cluster that allows the driver to customize information such as navigation and audio, offering classic and infotainment modes as well as Google Earth or Google Street View screen options. Audi smartphone interface enables Apple CarPlay and Google Android Auto integration, allowing you access to your compatible smartphone's features, such as navigation, telephone, music and select third-party apps. The available Bang & Olufsen sound system with 3D sound provides exceptional, clear, multidimensional acoustics and features 19 speakers, 16-channel amplifier and 755 watts of power. Available driver assistance features include Audi pre sense basic, Audi pre sense city, Audi side assist with pre sense rear, rear cross traffic assist, and vehicle exit assist. The Audi Q5 is engineered with legendary quattro all-wheel drive and the powerful 2.0 TFSI engine that puts out 252 hp and 273 lb-ft of torque. Paired with a dual-clutch seven-speed S-tronic automatic transmission that features remarkably fast and smooth shifting performance. Audi drive select allows the driver to pre-select five driver-selectable modes.